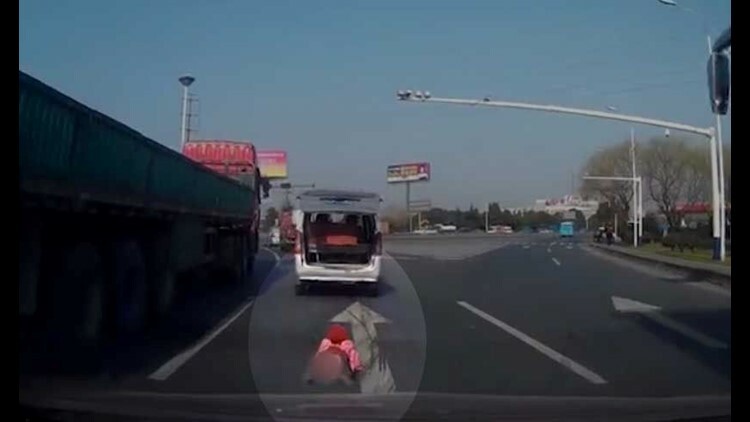 Dashcam footage shows a young boy fall out of the back of a van and land in the middle of a busy highway in Suzhou, China. CHINA (CNN) - Dashcam footage shows a young boy fall out of the back of a van and land in the middle of a busy highway in Suzhou, China. The video footage shows the driver appearing to be unaware the back of the van's hatch opened as the child falls out of the van. The dashcam footage taken from another car shows the child giving chase after the van as buses and cars roll past him on the busy freeway. The witnesses in the car behind the van stop to rescue the child. The van's driver finally notices the boy is missing and runs through an intersection to retrieve him. The little boy appeared to be uninjured from the ordeal. Video report via CNN Video Affiliate Network.